As we investigate the realms of life in the Natural World, we find that they divide generally into four major kingdoms of terrestrial life: Plant, Animal and Human, with the Spiritual dimension as the basis of them all. Archbishop Trent’s reference above points out that biological life forms reflect the principles governing the Kingdoms of Life, which find their origin in the realm of the Spirit. This is a key to revealing God’s Intelligent Design of the Works of His Hands. This key is seen also applied in how both the golden section and Fibonacci Series govern the growth of life forms from the micro to the macro, an indication of Symmetry and beauty in God’s Creation [Rom. 1:19-20]. Our challenge is: if we identify and apprehend key elements of the perfect symmetrical design that God employed in His divine order of the four Kingdoms of Life, then we can expect to see these Symmetry principles of at work in other aspects of His Natural Order also. As we focus on the key numerical patterns which we find throughout the Natural Order, this can give us a broad panoramic view of the “mathematical exactness and scientific precision” inherent in other aspects of God’s Works. As we search for these corresponding perfect patterns, in related aspects of the Four Kingdoms of Life [Ps. 8:3-9], (Plant, Animal, Human, Spiritual) then we can gain Biblical insights into each of these kingdoms, under the overall sovereignty of the Kingdom of God, bearing the fingerprints of the Creator’s Perfect Hand, even as God’s Word “engraved in the Celestial order” does. The Kingdom of God depicts in its the various elements, categories and kingdoms of life in His creation, His eternal and omnipotent power, the visible revealing the invisible as a perfectly ordered manifestation of His divine wisdom. Genesis 15:1-6 After these things the word of the LORD came unto Abram in a vision, saying, Fear not, Abram: I am thy shield, and thy exceeding great reward. 2 And Abram said, Lord God what wilt thou give me, seeing I go childless, and the steward of my house is this Eliezer of Damascus? 3 And Abram said, Behold, to me Thou hast given no seed: and lo, one born in my house is mine heir. 4 And behold, the word of the Lord came unto him, saying, This shall not be thine heir; but he that shall come forth out of thine own bowels shall be thine heir. 5 And he brought him forth abroad, and said, Look now toward heaven, and tell the stars, if thou be able to number them: and He said unto him, So shall thy seed be. 6 And he believed in the Lord; and He counted it to him for righteousness. Sometimes it helps to get our bearings in the study of Scripture by asking questions, as we have above, related to the usual list of: What, Where, Why, When, How and Who? In the final analysis, when we allow God’s Word to have preeminence, it will reveal its meaning in the details. We have outlined in a general sense, the principles of Biblical Interpretation in the “Research Principles” of our Reference Section here in the Try-God website. Let’s take a closer look at some of the words divinely utilized in this section of God’s Word. The word for “tell” in verse 5, is the Bible’s first usage of the Hebrew word caphar [H5608], meaning to “inscribe, celebrate, narrate, tell, make known, or praise.” It also carries the meaning of “a scribe, or writer, when used in reference to a person.”3 This word is used in Psalm 19:1; rendered “declare” in the KJV; as The Heavens declare the glory of God… [Psalm 97:6]. God was telling Abram to look up at the heavens and recount, declare, or narrate the truth revealed in the celestial gospel, if he could. Abram not only did this accurately and well enough to please God, but he also realized that despite the physical impossibility of child-bearing at Abram and Sarah’s advanced ages, he saw that the promised seed, prophesied in the stars would come forth out of his own loins. For Abram’s acts of believing, “God counted [H2803] it to him as he was righteous.” This is the foundation for salvation by faith in the N.T. [Rom. 4:17-22], because God not only mercifully with held the wrathful judgement we deserve due to sin, but He also freely shares the Grace of His righteousness with us, which we do not deserve. The Word for “counted” in verse 6 above is chashab in Hebrew meaning to reckon or esteem, meditate, combine or devise.4 It is also an accounting term used in the context of the 7th Sabbath of years and the sacred 50-year Jubilee system of timekeeping in ancient Israel [Lev. 25:27, 50-52, 27:18, 23]. The Levitical Law shows us both cardinal and ordinal applications of “counting,” in this record, but it does not portray them as interchangeable terms. As we will see from its Biblical usage in this record, the ordinal meaning of a number includes much more than just the numerical sequence where a particular number occurs in a series. We will find numerous examples of this especially where God utilizes the phi ratio in His organization of Creation. God’s statement to Abram builds on an earlier promise in Genesis 13:16, where God would make his “seed as the dust of the earth: so that if a man can number the dust of the earth, then shall thy seed also be numbered.” This earlier promise from God to Abram established a relationship between Abram’s seed, or offspring, in the earth, while this later promise in Gen. 15:5 connects Abram’s seed with the stars. [Ex. 28:15-30]. 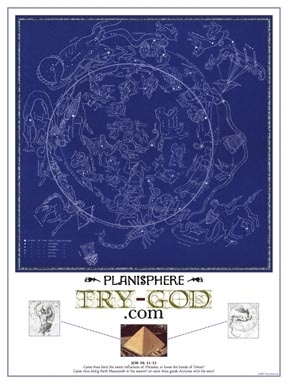 Below is an example of the 12 major signs of the zodiac as they are found on the ecliptic, relating to the 12 tribes of Israel, which is also a poster available in our bookstore. Since we are discussing the Creator’s ordained structural categories providing the foundation of a Bible based approach to the Philosophy of Knowledge, as it is laid out in God’s Covenants with Man through Abraham, it would be remiss if we did not recognize the significance of the phi ratio as it relates to this very significant and instructive subject matter. In the context of our conversation, the phi ratio would be classified as a type of ordinal group-an infinite mathematical series. By their very nature, infinite mathematical series are abstract and theoretical because we do not find them progressing to infinity in the concrete physical world of our five senses “reality.” This is not to say that the phi ratio does not occur in Nature. We will see more evidence how God has chosen to pattern the growth of all Four Kingdoms of Life in Creation, after the numerical dictates of the phi ratio series. This is a profound lesson in itself, because God is telling us that: The Only Infinite God is the Source of All Life, ordering His Kingdoms of Life by an infinite mathematical series, [John. 1:3-4, Jas. 1:17-18]. This also sets up the “physical reality” as opposed to the “mathematical reality,” referred to in G.H. Hardy’s quote at the opening of this study. The Almighty is certainly “competent” to discuss the parameters of these matters, where Hardy, in his humility did not feel himself up to the task. As we have found, the growth patterns of the Plant, Animal and Human Kingdoms of Life progress through their preordained stages of growth, via the mathematical dictates of the phi ratio, we witness the Creator’s Intelligent design in application. There are also examples in God’s Word where Spiritual growth follows the dictates of this phi pattern. 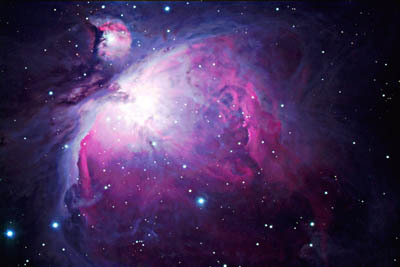 When we are born into this world, our physical body grows as it passes through its ordained finite life stages. But with our Spiritual New Birth, we are set on an everlasting path of an infinite living and loving relationship with our Heavenly Father, through His only Begotten Son, Jesus Christ. Here we find a life that begins as a representation of a finite series, but never ends like its physical counterpart. Our physical body becomes a Holy Temple that houses our sacred everlasting spirit, until we inherit our new bodies at the Lord’s Return. Thus, as we follow the path of light into way of holiness that God sets before us, we embody the infinite series that our Lord and Savior Jesus Christ still lives, as an example for us to follow. His perfect example shows us how his authority not only includes the original power of the fallen Morning Star, who presided over ten categories of precious stones, or angels, in the First Heavens and Earth [Ezek. 28:13], but also that of the Risen Morning Star, presiding over 12 categories of precious stones, representing the 12 tribes of Israel, in the breastplate of Israel’s High Priest, the 12 signs of the zodiac, and later also the 12 apostles at the foundations of the Grace Administration, along with the 12 foundations of the New Jerusalem. 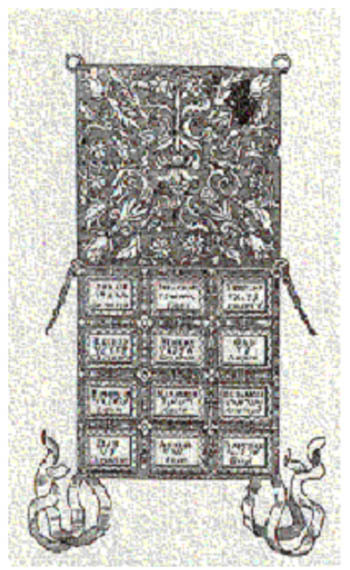 In keeping with the celestial symbolism theme, the High Priest’s breastplate, was divinely designed with a compartment which held the Urim and Thummim, or lights and perfections; representing the two great lights, the Sun and Moon. As oracles of the High Priest, these two stones revealed the wisdom and glory of the Creator by lot, even as the heavens declare the glory of God in their numerical order [Ps. 19:1], whose glory is revealed in the cycles of the Sun, Moon and Stars of the zodiac. This was a primary means whereby the High Priest could get revelation from God by using the precious stones of his “ephod,” relating to the celestial cycles of the Sun and Moon. Any question posed by the man of God, would be answered either in the affirmative or negative by one of these two stones. Another method God could talk to the High Priest involved the use of the 12 precious stones, corresponding to the Stars, which were interpreted and understood Biblically, according to the 12 signs of the zodiac. As the Priest “cast lots” utilizing one of these methods, the Wisdom and Will of the Heavenly Father was revealed. A detailed study of the principles governing the rule of these two great lights, over day and night [Gen. 1:14-17], preserved in Israel’s luni-solar Calendar, is seen in The Calendar of the Biblical Patriarchs article of our website. As Israel’s calendar shows the perfect correlation of the sacred cycles of the Sabbatical and Jubilee, harmonizing with the secular aspects of the celestial cycles governing the Rhythms of a myriad terrestrial and cosmic cycles, we find more evidence of both the cardinal and ordinal use of number in Scripture, regarding the timekeeping practices of the Biblical Patriarchs. In these practices we see the dominion of God’s light reflected in the heavens and ruling over all the kingdoms of terrestrial life [Gen. 1:14-17]. These fundamental life cycles reflected in the celestial order, depict the divine Canon of Creation and the Science of the Creator, which was symbolized in the architecture of the Temple and Tabernacle of Israel, and the Great Pyramid. This dual standard of sacred and secular order is unified in Jesus Christ as the High Priest-King of Israel. We find more references to the 12 stones and their variants in the “living stones” of I Pet. 2:4-7, and the 12 foundations of the New Jerusalem; [Rev. 21:19-20]. Here we find a unified witness of the 12 tribes of Israel bringing forth the promised seed unto the New Jerusalem, in unity with the “heavens declaring the glory of God,” the witness of the 12 signs of the zodiac. We will see more aspects of this Tree of Life as our study progresses. Sign up below to get the latest info on Biblical Astronomy, the four blood moons and great insight into the celestial wonders above! What is the Dendera Zodiac? This poster depicting the ancient zodiac found in the Temple of Hathor at Dendera, Egypt, provides an insight to a historical viewpoint of ancient Astronomy. This Poster shows the Great Sphinx and the Great Pyramid of the Giza Plateau, at the top with arrows forming a figure 8 extending thru the zodiac. As the arrow follows Axis E, it intersects the 2 fish of Pisces, highlighting the Piscean Age of the Precession of the Equinoxes, whose inception witnessed the birth of Christ, and whose conclusion will see His victorious return to the Earth. Each of the 12 signs of the Solar Zodiac are labelled as a great celestial clock-face around the edge of the Zodiac. 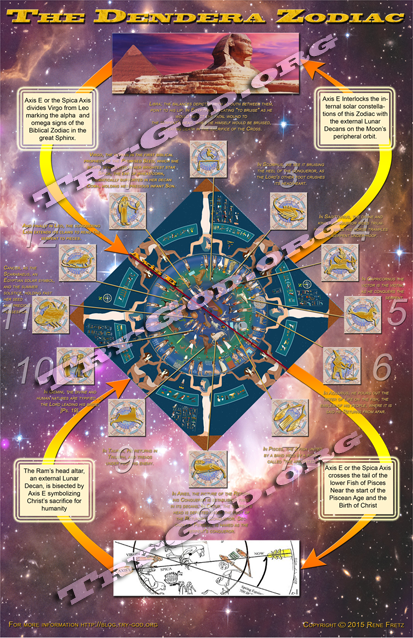 This beautiful one-of-a-kind Dendera Zodiac poster serves as a handy study/reference aid, while adorning your walls with a unique piece of artwork. $13.00 Includes S&H, it makes a great gift for all occasions. This is a 81 minute full-length multimedia presentation, providing a foundation from which many future presentations on Biblical Astronomy will launch. 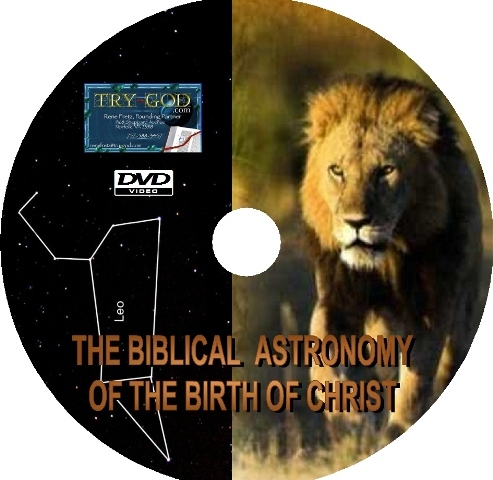 This DVD answers many questions that still plague this critical area of Biblical Astronomy, clearing up much of the confusion that lingers like a cloud over the birth of Christ. As we reveal the Biblical, Archaeo-astronomical, historical and celestial secrets of the Birth of Christ, we will see how the day, time and even hour of his birth is nailed down like never before. As we walk the trail of the intrepid Persian Magi through their 600 year historical trek that led them to Jerusalem, and ultimately to the Christ-child, you will see ages of tradition, myth and confusion dissipate before your eyes!! This unique presentation is yours for $19.95 USD, which includes shipping and handling in the lower 48 states. Stay tuned for some exciting surprise spin-offs from our initial DVD offering!! Join us in the conversation and get updates, more info and exclusive articles in your email! Join us today! Ancient Monuments of Biblical Archaeo-Astronomy- Part 2. © 2019 Try-God.org | Blog Marketing provided by SEQ Marketing. All Rights Reserved.